Looking for school holiday activities? Qualified kids yoga instructor Aisling McIlwain will be running a kids yoga workshop these school holidays. Kids yoga involves basic yoga poses, moving and stretching, balancing skills, creativity, connection (with self and other peers), song & dance, yoga games, mindfulness, breathing techniques, relaxation, reflection & of course….lots of fun! Aisling (pronounced “Ashling”) is a fully qualified kids yoga instructor, in both the pre-school and primary school aged groups. Kids yoga is a specific technique – it’s not just a matter of adapting adults yoga to smaller bodies. 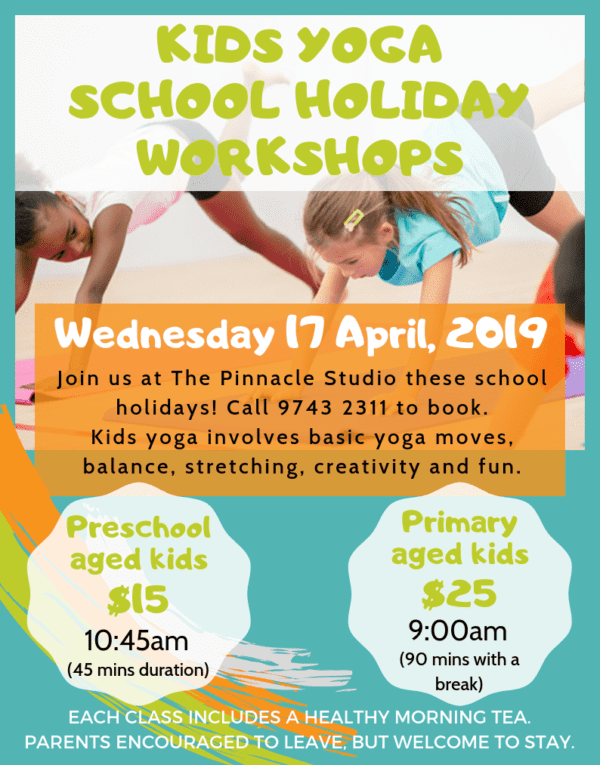 The classes involve a lot of fun and games as well as introducing kids to the basic concepts of yoga such as holding certain poses, learning balance, self-awareness, connection with other class mates, stretching, creativity and of course fun! Aisling absolutely loves teaching kids yoga, including to her own 2 kids. She has been practising yoga herself for a long time, and really enjoys being able to pass this enjoyment on to kids in a fun & accessible way. You can either call us on 9743 2311, or CLICK HERE to book online. A water bottle with your child’s name on it, and loose, comfortable clothing. Can I stay and watch while the workshop is on? Parents or carers are welcome to stay if you (or your child) prefer, however we do recommend you try and leave your child if possible. We understand that pre-school aged kids would be less comfortable with being left, however please be aware there are space limitations in the studio so if we experience a high number of bookings, there won’t be a lot of room for parents to stay. But don’t let that stop you from booking your child in – by all means stay if you need to! If you are happy to leave, we recommend heading down the road to visit Love Life Cafe, 78 Queen St Concord West. The lovely Adele has generously offered a free regular coffee to the parents of any of the kids attending these workshops. Vouchers will be provided when you sign your kids in for the workshop. What better way to spend your child-free time? Alternatively, you might be able to book yourself in for a quick massage at the clinic while you wait! Will my child be 100% safe if I leave them? Absolutely. Your child’s safety & wellbeing is our top priority. The door to the studio will be locked for the duration of the workshop, so there’s no risk of outsiders wandering in. 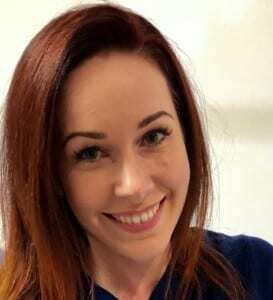 Aisling is fully trained and experienced in teaching kids of this age, and she (and our clinic & studio) are fully insured in the very rare instance that any mishap may happen. But we know nothing will go wrong! What’s the minimum age for the pre-school workshop? Ideally 3 is the minimum age, however please ensure your child is able to concentrate for the whole 45 mins and wouldn’t be a distraction to the other class members. If they’re used to a pre-school environment then they should be fine with the class.